Ok, our cookies should be well covered. Don't let ANYONE get their grubby little hands on our cookies. Watch out for Crystal (our LCO), she'll yoink a cookie right out from you in a heart beat. OK everyone, I've been off the boards for a week with Randy and exams. Yeah! He's out for a week. Yes! So, I catch up on email and get on the forums and I see our very own Beth is running for Legion Council. And, I get a long email about Neil. I don't want to start any business about that here on this thread, but can someone PM me if its something I really need to know. I'm sooo confused. Also, its time to think Christmas ornaments - I saw that thread and I'm ordering more shirts. Boy, I was busy last night catching up. So, when's our fall party? I think we should all bring a batch of homemade cookies to celebrate all the new positions. I know we're going to have a blast this year!!! So a big shout-out to Beth!! And good luck! The infamous email.... don't worry about it. It is being handled as we speak (or type). Fall get-together. Yes! We should have one. If you wanna start a new thread on that subject so we can discuss it, please feel free to do so. And last but not least.... YES! I think we'll have a great year! I am very optimistic about the coming year....and for that matter the coming months. All nominations sound awesome. I just want to have good communications between us and national happenings (esp. any merch on sale and how to order links; etc. ); events; cooperation with GA501st and local events; etc. Thanks to Beth for all her hard work and best luck in council nomination. You have my vote! And may Bespin have a fantastic year. Take time to look at the ornaments - looks like it will be the hair styles from the princesses. Need I say more? Updated the list with ALL officers listed. Congratulations to all our new officers! I feel confident that these folks will do an outstanding job. And I am looking forward to starting the new term as CO. BESPIN BASE RULZ! 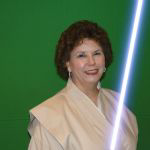 And I want to send a BIG thank you to Beth Spires/Phrog for all the work she has done as CO of Bespin Base! We couldn't have gotten this far without ya! Good luck with the Council elections! We've got a good group of folks here... not just current officers. This is going to be good year. We've got a good group of folks here... not just current officers. Couldn't agree with you more here!